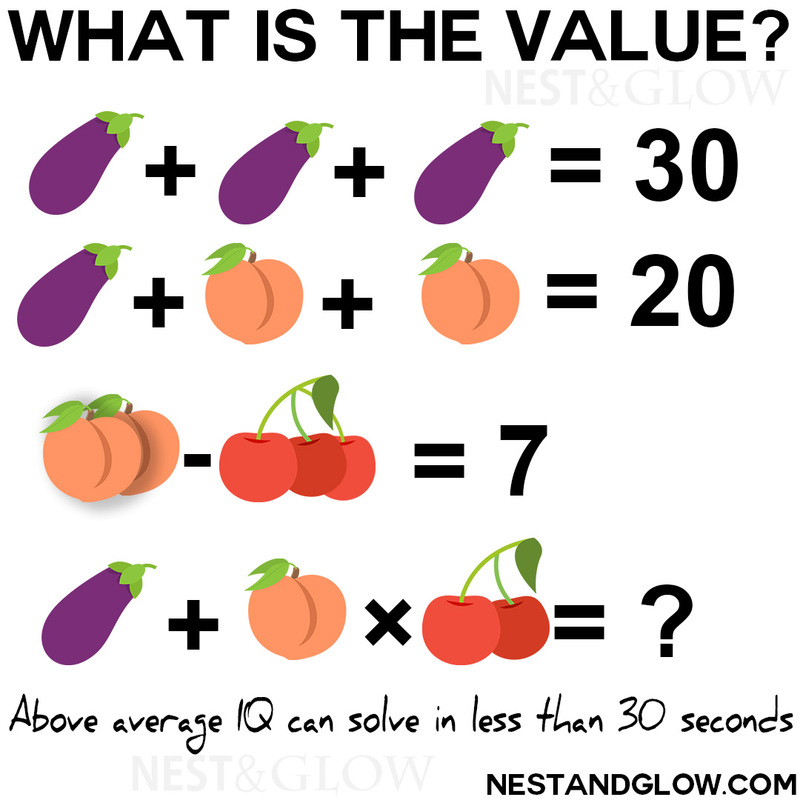 Can you work out the solution to this Aubergine Peach Cherries Maths Puzzle in less than 30 seconds? Well done if you can, you have an above average IQ! Check the answer below to see if you are right. I’ve tested this puzzle out on several friends and they came back with 8 different answers, but there is only one correct answer. If you get it wrong then try to work it out from the answer before looking at the hints and solution. If you really can’t get it we’ve got two hints that you can work through before jumping to the solution. Some believe that regularly solving math problems helps to improve memory, think faster and have quicker reactions. Also, some studies have shown that regularly exercising your brain may help to protect against dementia. [su_spoiler title=”Show solution” style=”simple”]Aubergine is 10, Peach is 5, each cherry is 1. There are 2 peaches on line 3 and 3 cheries so 10 – 3 = 7. On the last line there is one aubergine, one peach and two cherries 10 + (5 * 2).